Home » Urgent Volunteer Opportunity! The B’ville Express Senior Transportation Program has an URGENT need for volunteers to transport seniors in your neighborhood to their appointments, helping them to remain independent while accessing essential services. B’ville Express drivers are utilized as often ( or as infrequent) as they want to volunteer. YOU TELL US! 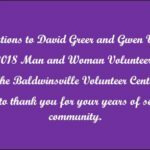 Volunteer drivers will register with the B’ville Express by calling Gina at the Canton Woods Senior Center, 315-638-4536, or by emailing RCARROLL@BALDWINSVILLE.ORG. Please help your senior neighbor and volunteer today! The B’ville Express is funded by the Onondaga County Department of Adult and Long Term Care Services. April 3, 2019 / In Uncategorized / By Carmey Evans / Comments Off on Urgent Volunteer Opportunity!